How do I get to the Wilderness Resort & Retreat ? Cawley Point ? What activities are available to guests? Boat tours ? we can help you arrange a tour to any of the local attractions. Games ? Build a team and enjoy some of the provided games such as lawn bowling, crochet, frisbee, football, soccer, bean bag toss, horseshoes etc. Yoga and Meditation - Grab one of our yoga mats and sneak away to one of our many secluded beaches or view points, surround yourself with nature and enjoy the peace and serenity your soul has been longing for. Wood fired pizzas - We offer ?Make your own pizza night? for a small fee toppings and dough will be provided. Gluten free options are available as well. Help get the fire started, grab a Peel and shovel your pizza in just like the pros and cook it just the way you like it! What a great way to socialize with friends and family! Attention Artists: Bring your art supplies whether its charcoals or paints pick one of of many view points setup for the day and let your mind run wild! Bird watching - Explore our beautiful property and find many of the Sunshine Coast?s bird species. Hiking - Hike and explore our vast land and trail systems. Relaxing / Suntanning / Lounging! - bring your stressed out self and forget the city! Please get in touch with us ahead of time to help you arrange tours or diving. Meals:Do you provide meals or do I bring my own food? Option 1 - Meals for Purchase at the resort. The meals will includes breakfast, lunch and dinner during your stay. The menu will be from vegetables grown from our garden & locally sourced ingredients with the focus on West Coast / Canadian fare. Option 2 - Bring your own food - If you are renting a cabin you have the option to bring your own food or purchase meals at the resort. We are not equipped to have you bring your own food if staying at a tent or yurt at this time. Option 3 ? make your own pizza?s in the evening in a wood fired oven. Making 8? pizzas (gluten free dough available) is a fun way to socialize and make creative meals together. Please feel free to bring your own. Please note: we are off grid and do not have an ice maker at the resort at this time. Feel free to bring a cooler and ice with you or we can arrange ice for you with advance notice. Food in Tents: Can we keep food in our tents or yurts? No. Please do not store food or snacks in tents or yurts as it will attract insects and animals. All food should be stored in the Hub kitchen or a cabin kitchen. This includes snacks, candy, chips, chocolate, granola bars etc. Cooking facilities: If I rent a cabin and bring my own food, what are the cooking facilities that are available to me? Cabin 1 has a full kitchen with stove, fridge, counter space for food prep, large dinning table as well as a BBQ on the deck. Cabin 2 has a coffee / tea area, large dinning table and BBQ outside on the deck. If staying at Cabin 2 you are welcome to store food in your cooler or we can provide you fridge space at the Hub. In addition, the resort has 6 BBQ's available to our guests. We also have a wood burning pizza oven and a commercial kitchen which is operated by our kitchen staff but if you want to create your own wood burning pizza master piece our staff will be happy to assist. No. Linens, bath and beach towels are provided, you do not need to bring your own. If you are renting our Kayaker's / SUP Special and paddling in with your own sleeping bag and don?t require linen?s please indicate at the time of booking. Please bring your swimsuits, hat, sunglasses, sweater / layers for evening, rain jacket in case of rainy weather and your toothbrush! We also recommend you bring water shoes. We will have the following at the resort: sunscreen, mosquito repellent, bear spray, flashlights, shampoo / conditioner / body wash / toilet paper & linens. Can I bring my computer and will I actually get a signal? Yes, High-speed wireless internet access is available at the Hub and Cabins but maybe a bit far to reach all the Wilderness Tents and Yurts. Please note: telephone calling is limited to internet (ie Whatsapp, Skype) calling at this time. We require a minimum two night stay during spring / summer and 5 days during off season. However, a caution from previous guests? ?we wish we had planned to stay longer ? leave plenty of time for this stop on your vacation?? Can we hike the Skookumchuck Trail to see the world-famous rapids? Certainly. We will help you pick a day and time with best views of the rapids at their highest flow or ebb, and help you arrange a water taxi to and from Egmont for the hike. If we want to fish, how can we do that? You can fish off the dock with equipment available on site or we can arrange a half to full day fishing trip. Some of the best fishing is right in front of the resort! Remember you will need a BC Fishing license. Is there good diving in the area? Yes! If you are a diver, we can help you arrange for a group. Dive locations include the sunken ship Chaudierre, Tzoonie Narrows and Agammemnon Channel/Skookumchuck. Can I do a multi day Kayak or SUP trip? Yes! 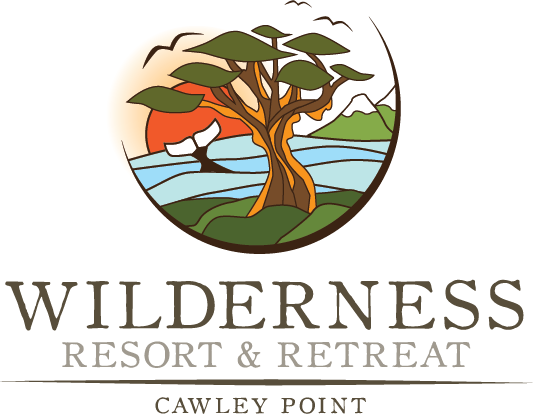 The Wilderness Resort and Retreat is an excellent staging area for your paddle adventure. You can paddle the: Sechelt Inlet, Skookumchuk Rapids, Hotham Sound, Tillicum Bay to Nine Mile Point or even down the Salmon & Narrows Inlets. We can help arrange a guide or let you know of upcoming training sessions in the area.